Enjoy Maine’s Southern Coast by getting out on the water. 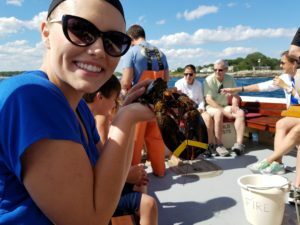 A Rugosa Lobster Boat cruise is a great way to see the sights and learn about our Maine crustaceans. We have some beautiful coastline on our doorstep here in Kennebunkport. Getting out on the water is a great way to see our picturesque town’s attractions from a different perspective. These visitor favorites include Walker’s Point, summer home to President George HW Bush and his family. You can also see St. Ann’s Episcopal Church perched on the rocky shoreline along Ocean Avenue. The Rugosa is owned and managed by Captain Bob. Bob moved to the Kennebunks several years ago and bought the Rugosa because it allowed him to keep up with his love of boats and the water. He sails from the Kennebunk River at the Nonantum Resort on Ocean Avenue three times daily, weather permitting. In addition to getting out on the water, these lobster cruises are a great way to learn all about lobsters and this important Maine industry. The “Lobster 101″ course given while on board includes pulling several of their traps so that you can get some hands on training. Yes, you get to band them and then hold them! Sorry, all lobsters are returned to the water before heading back to shore so you’ll have to hit one of the restaurants for your fresh lobster dinner! Female lobsters have smaller claws than their male counterparts but wider tails (for protecting her eggs….more on that to come). the tail starts. Larger and smaller are returned to the water. A lobster trap is usually baited with herring and the lobsters can swim in and out of the traps so they really aren’t “trapped” at all! Just bad timing if you happen to be in the trap when it’s brought to the surface by the fishermen. A female lobster mates with a male when she molts from her shell. He protects her until her new shell forms and then leaves. One lobster will produce 5,000 – 100,000 eggs. Only a very small fraction of those actually survive to become adult lobsters. The female carries the eggs on the underside of her tail. If she is captured in a trap while carrying eggs, her tail is notched and she is put back in the water. Once her tail is notched, she must always be returned to the water if caught by fishermen, whether she is carrying eggs or not. Soft shell lobsters are lobsters that have recently molted and are in their new shell. It’s larger than the lobster to give them room to grow so is full of salt water which makes the meat more tender. The shells are easier to break through as well. Hard shell lobsters fill out most of the shell and are a lot harder to crack when eating. Prices are different with soft shell running a little bit higher per pound. There’s loads more to hear about and being out on the ocean with the sun and wind on your face can’t be beat. 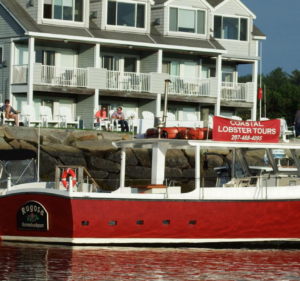 For many of our guests, a trip on the Rugosa lobster boat continues to be a highlight of their Kennebunkport stay. Each cruise runs about 1 1/2 hours in length and the cost is $30 per adult and $20 for children under 12. It’s very popular so we do recommend that you make your reservations early. We are always happy to take care of that for guests of the 1802 House Bed and Breakfast to make sure you don’t miss out on this fun Maine experience.